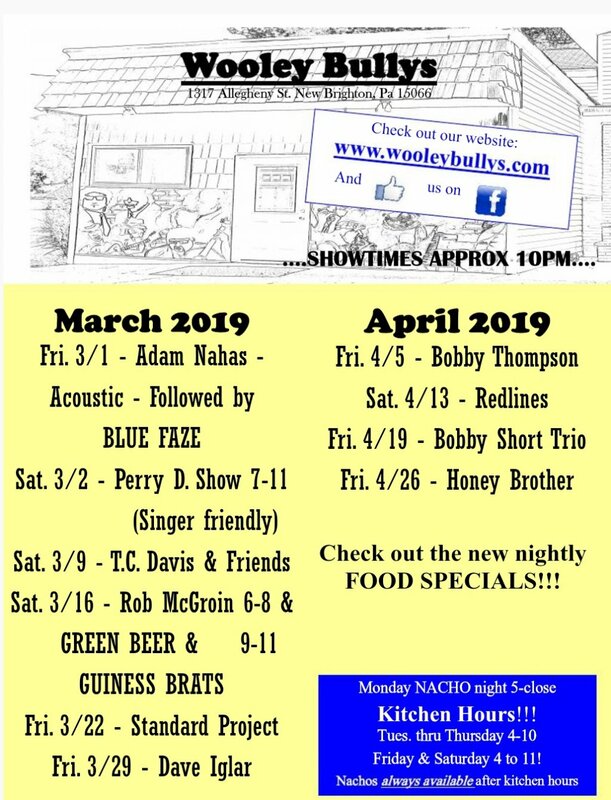 Wooley Bullys is a locally owned business located in New Brighton, Pa that's been wetting whistles since 1936! THIS YEAR WE ARE CELEBRATING 83 YEARS!!! We serve up a variety of libations from Moscow Mules and Rotten Apples to Coors Light Banquets and PBRs. There's always eight unique beers on draught along with a large selection of craft beers including Fatheads, Kasteel, & Blue Moon. LIVE MUSIC two to three nights a week with a variety of rock and blues. Never a cover and most shows start at 9:00 pm. OPEN STAGE BLUES JAM the 2nd Saturday of each month hosted by Eugene Morgan! We have some of the BEST BURGERS and CHICKEN SANDWICHES that will ever hit your palate! And you must check out the CHINA GIRL consisting of an array of season-fresh veggies, premium chicken breast & pot stickers and your choice of house teriyaki or house general tsos along with many other unique dishes! We are also serving up gourmet pierogies, pan-fried wontons and DAILY SPECIALS. Although we are a small establishment, there is nothing small about our service and quality of food. We use only the freshest ingredients and aim to please. We are devoted to making sure you don’t go home hungry! NACHO MONDAY!!! Serving ONLY nachos from cheese and salsa to FULLY LOADED all day and night! Visit us today for a great meal at a more than affordable price! KITCHEN HOURS are Monday NACHO night ALL NIGHT LONG! Tuesday thru Thursday 4:00 pm to 10:00 pm. Friday and Saturday 4:00 pm until 11:00 pm ! NACHOS AVAILABLE EVERY DAY AND ALL NIGHT LONG til closing time. DAILY APPETIZER SPECIALS! Closed Sundays except for STEELER GAMES!!! Click here for a downloadablecalendar!